Maybe you haven’t realized it yet, but I’m pretty sure you, just like anyone else spends a large portion of the day in the kitchen and the dining room. And not just for eating, you could be preparing food and supplies, entertaining guests, writing stuff or simply doing an activity that requires a larger surface. Well, that is what the dining table is for, besides eating. But you don’t really have to go to the furniture store and buy an overpriced dining table just because you need one. You can always make one by yourself for a very low price or even for free, depending on the kind of materials that you have in stock. A mirror base supports the beautiful solid wood surface of the Kingdom Dining Table. 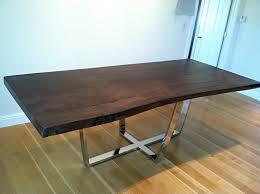 Perfect for a modern dining room, the table has a surface made from solid walnut. Round design insertions in the two wide legs help the mirrored finish to maintain the glamorous and luxurious overall look. 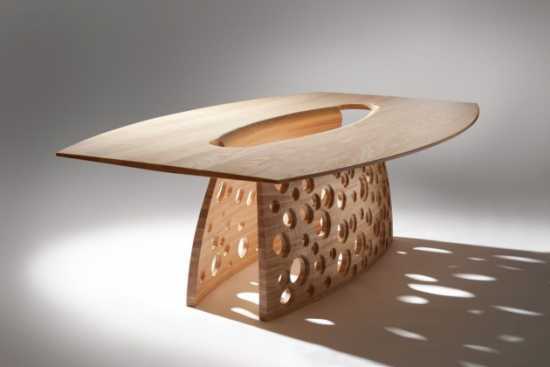 This unique dining table derives inspiration from Mother Nature’s backyard. Made using solid ash, it mimics the natural erosion process of coastal rocks. 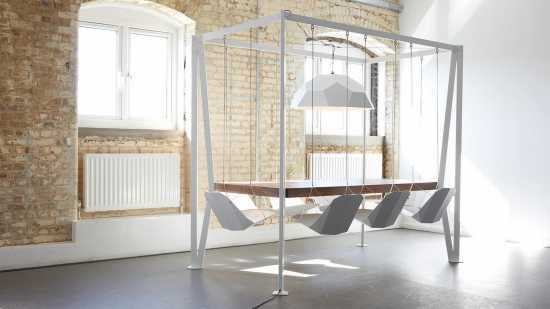 It is the ultimate piece for everyone who loves to boring the outdoors in. We chose this table because of its hard natural beauty. It has a handmade cast bronze base which makes it an impressive addition to the dining room. The semi-finished walnut top keeps the heavy lines of the design at the maximum, making the dining table strong and astonishing. 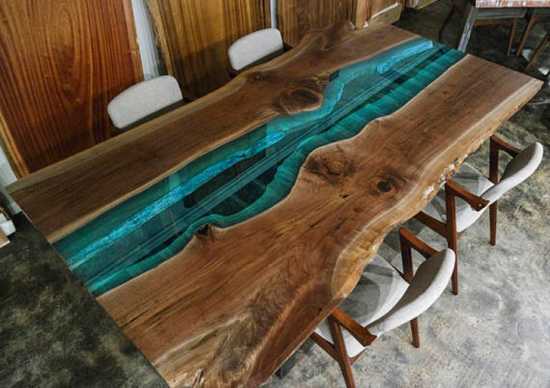 This has to be one of the most unique dining tables ever. It transforms the meal-time experience into a relaxing adventure. It also adds a bit of spice to your interior space as it projects creativity from all angles. 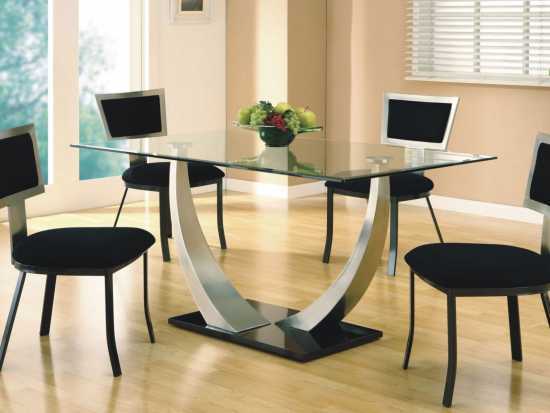 This beautiful contemporary dining table rests on chrome-plated legs, which makes it look sleek and inviting. The clear glass top is a modern touch that also works like a luxurious surface on which the best food is served. If you want to impress your dinner guests, this table will do the trick. The butterfly table brings you the best of both worlds. 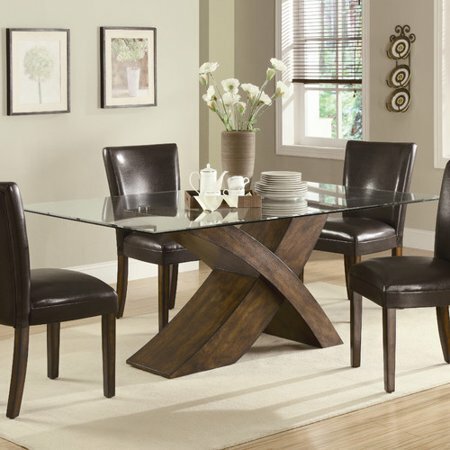 It uses a modern finish and the timeless appeal of natural inspiration right to your dining space. The elegant finish makes it ideal for any type of interior décor. 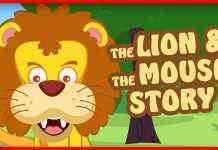 Choose between the marble top and the extendable design. 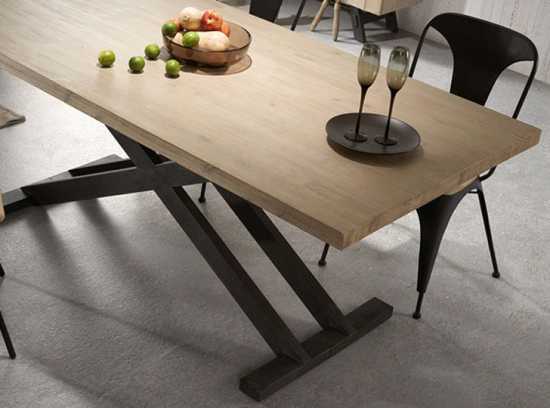 The Extendable Frame Dining Table is the perfect urban dining table. It extends from a small, stylish dining table to an elegant table setting that can accommodate up to 10 guests. It looks beautiful in both situations: open or closed. 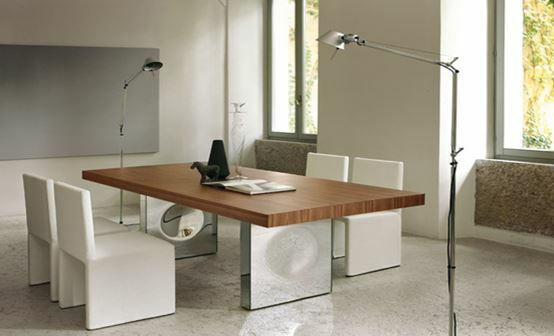 The dining table extends from the middle with the help of two panels. 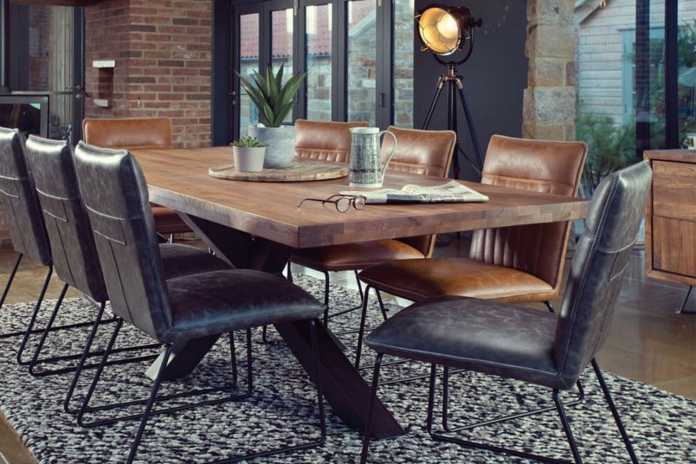 This rustic dining table set takes you on a trip back into time. The execution is artistic and shows great attention to detail. Set it in contrast to a modern interior décor or compete your rustic theme and create harmony. Either way, you cannot go wrong. It is another beautiful round dining table with elegant features. Made from wenge stained cherry wood and covered with a transparent glass top surface. 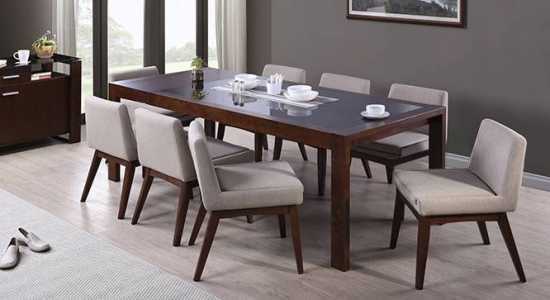 The Wade Logan is one amazing dining set. It takes on its own identity to create the ideal statement piece for your dining space. It offers lots of artistic relief with the shapely pedestals on which the top sits. And the minimalism of it all is extraordinary. Whether you are looking to grace a casual or formal dining space, you cannot go wrong with the Branka. It features a unique base that turns it into a masterpiece. It also gives it the ultimate contemporary look to ensure it never goes out of style. Simplicity is at the core of this design. It is what makes it all the more outstanding and aesthetically irresistible. It sports a classic look that uses solid oak to add a touch of sophistication. The top starbust effect makes it all the more alluring. At times it is not so much about utility as it is about elegance. When decorating your contemporary interior you need that one piece that ties it all together. 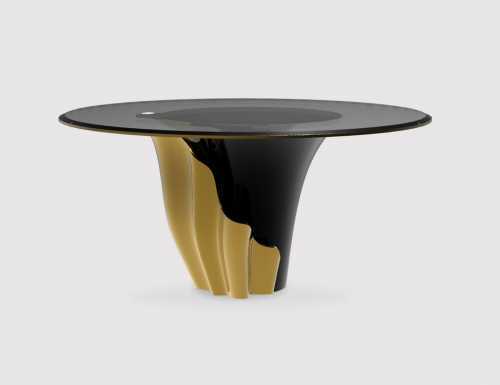 That piece is Yasmine, with her curvy base and the gold and black finish. She is the perfect centerpiece for a contemporary space. 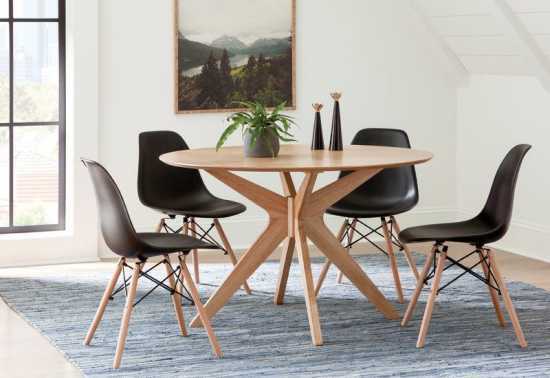 This unique kitchen table and chairs are effortlessly elegant. The cross-legged design lends the set authenticity and gives it a certain royal look. Whatever the occasion, this design will be a major highlight and will make it a memorable experience. Sleek is the name of the game when it comes to this piece. 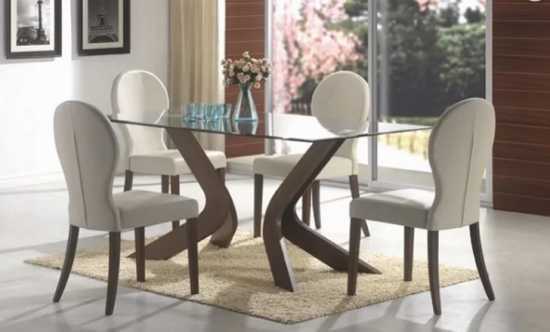 It is a simple and cool dining table that does not try too hard to please. That is probably what makes it awesome. The shapely pedestal makes it a beauty to behold and adds visual interest to your room.